To the North of the Appenines, (known as Italy’s backbone) lies the Po River and its 200+ tributaries, stretching from West to East. Its watercourses have changed dramatically over the past 2,500 years, both naturally and with the help of Man. This area was known as Cisalpine Gaul. Venice is, of course, famous for its canals. But hundreds of years before its construction was even started, and when it was just marshland, the city of Ravenna, to the south, was already there. Its origins are a mystery. It was probably built by the Etruscans, around 625-700BC. They were skilled hydraulic engineers, draining the marshlands and constructing a complicated network of canals, which also channelled water for farming purposes. In the 1st century BC, the Romans arrived and took over the city. Perfect mosaic floors and other remains are still being discovered 6-7 mts below street level. But strangely, their writers, including Strabo and Pliny the Elder didn’t write anything about the town’s inhabitants. Strabo described Ravenna, as it was already known; ‘A city built entirely on wooden piles and coursed by rivers, it is provided by thoroughfares by means of bridges and ferries. Here the drift of the tide together with the river currents purify the swamps by removing their ooze and filth; hence human settlement becomes possible in a space usually populated by insects, frogs and snakes, and a flourishing economy develops, mainly based on controlling trade and inland waterways. The place is considered so healthy that it is chosen for feeding and training gladiators. Julius Caesar set off from Ravenna towards Rimini to reclaim his empire in 50BC. When he reached the Rubicon River, he had to make the decision, whether to turn back or go on. If he went on, there would be no turning back. In 27BC, Augustus started work on enlarging Ravenna’s port. It eventually had room for 250 ships, plus several acres of storage on the land. Augustus also built the Fossa Augusta; a deep canal which ran under Ravenna’s town walls, and two miles to the sea. The town’s main problem was fresh water as the rivers and canals were very muddy. The residents had to rely on rainwater. ‘That landlord at Ravenna is plainly but a cheat. I paid for wine and water, but he served wine to me neat’. It was also said; Ravenna’s frogs in better music croak. The frogs seem to have been famous. In the 2nd Century AD, The Emperor Trajan built an aquaduct about 70km long, following the river from Meldola and finally bringing fresh water to the city. 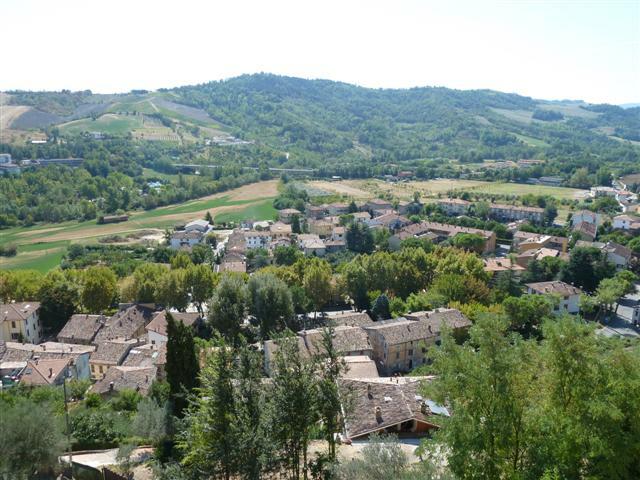 It was restored by Theodoric in 534 after the fall of the Western Roman Empire. Rivers and canals stretched for 120 miles from Ravenna to Altium. During Vespasian’s time, galleys could travel from Ravenna to Etruria. In a letter dated around 450, Apollinaris Sidonius described a voyage from outside Milan to Ravenna in a large boat called a cursoria, with singing all the way. By the way, when Leonardo Da Vinci was employed in Milan around 1482, it was as an engineer for their many canals, not as an artist. He designed the lock that is still used today. The Chinese had designed a flash lock, but it didn’t work very well. There were several towns in Northern Italy built on canals apart from Ravenna and Venice, and the main form of transport over the North of Italy, (Cisalpine Gaul,) was by boat. After the collapse of the Roman occupation, Ravenna, and most of what would become Italy, seems to have gone through several centuries of terrible turmoil. There were continuous invasions, and internal fights for power among the Dukedoms. In the 4th Century a long famine began. Agriculture failed, causing poverty, misery and the weakening of administrative power. Roads, canals, and all communication suffered. That whole area was, and still is, subject to drought, followed by bursts of heavy rainfall. By the 5th Century, Augustus’ magnificent port had completely silted up, and had become orchards. In 589 there was a terrible flood which started further North in the Piave River and changed the area’s geography. Then, in the same year, there was a Pestilence. The Plague claimed thousands of victims, right across the country. Strangely, it was during these hard times that Ravenna built the most magnificent buildings. Eight of them are still there and on the Unesco World Heritage List, containing the richest heritage of mosaics in the world. But sadly, they’re slowly sinking. Luckily, so far they’re sinking evenly, without cracking. 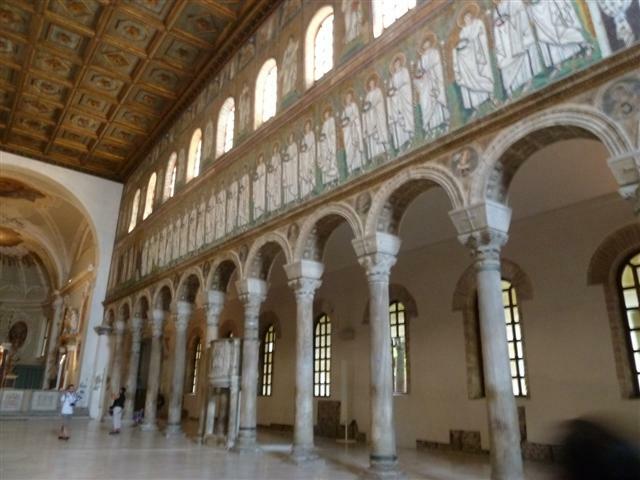 During the 7th Century there was a dramatic decline in Ravenna’s economic fortunes. The population numbers had dropped. The Po River changed its course, the water flow increased, and so did the sedimentation. The central Government system was in chaos. The city was decaying in the 9th Century. Historical buildings collapsed and were pillaged to be used as building materials. During the Renaissance the remaining canals were bustling with all kinds of boats, often lavishly decorated and used for show and entertainment. It must have been a fantastic, colourful sight. Everyone who was anyone owned a gilded barge, called a bucentaur. Popes and Dukes, new brides, distinguished guests, were all ferried around, and often greeted by musicians and water pageants. Sadly, in the 16th Century, there was again a lot of political trouble between the Ducal States. Many more of the canals became clogged and silted up. The 17th Century brought terrible floods again. The Rivers Ronco and Montone completely flooded Ravenna, destroying over 140 buildings. In 1696 there was a huge earthquake. Miraculously, all the historical monuments survived. The Rt Hon Joseph Addison Esq visited Ravenna between 1701-3. This is hilarious. Picture a Benny Hill sketch. All the Ss are written as fs, in the style of the time. Work re-started in 1738 when the Corsini Canal (named after Pope Clement Xll) was built, connecting Ravenna to the receding sea. At 11 kms long, it’s the biggest artificial canal in Italy. In the evening of the 8th April 1883, Europe’s first Co-operative of Labourers was formed in Ravenna. The following year, on 24th November, 1884, 500 men and 50 women, armed with wheelbarrows and shovels, set off to reclaim the neglected marshes of the Roman plain. They were successful, but many of them perished of malaria. Over 100 victims died in the first year alone. Finally, at the end of the 19th Century, it wasn’t the Adriatic Sea or the River Po that caused the end of the canals. It was the railway. Now there is no trace of the canals, except for the odd street sign saying Canale instead of Via. From under the ground though, the water sometimes fights to make an appearance. The San Francisco church (another UNESCO monument) has a flooded crypt, with goldfish swimming around. Like Venice, Ravenna is slowly sinking into the marshes. Once a thriving port, it’s now over 11kms inland. Imagine what was dropped or thrown into the canals and is now buried under the narrow, paved streets! 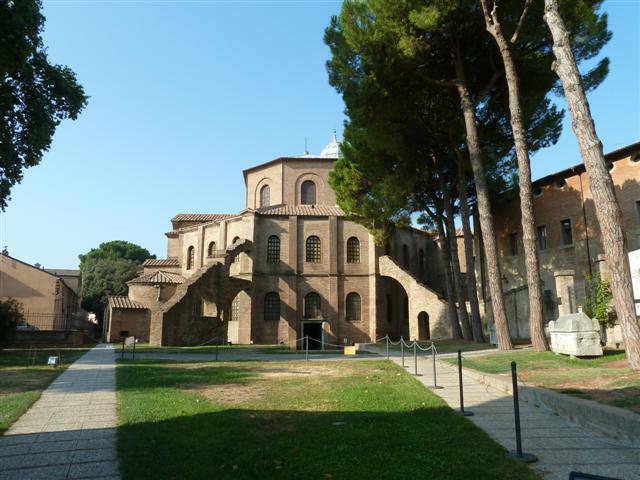 In between the modern Ravenna and the long, sandy beaches is a flat area where UNESCO’s Basilica of Sant’Apollinare stands, and the statue of Augustus points to Rome. Here was the province of Classis, and Augustus’ port. It’s buried safely under a huge field, waiting until there are sufficient funds to excavate it. I do hope it happens in my lifetime! You can still cruise along Italy’s remaining waterways, including the river Po.